As a dedicated, active user of the web, who tries to keep an eye on international digital trends, the recent ComStore study, announcing Russians to be the world leaders in social networking, came as a bit of surprise to me. As highlighted by TechCrunch Europe, the research found internet users in Russia to ‘waste’ 6.6 hours in social network sites, and on average views of 1,307 pages per visitor, per month. To put that level of ‘addiction’ in perspective: the average worldwide indicator is 3.7 hours and 525 pages per visitor. The first and, perhaps, the most significant factor, would be Ukraine’s low internet penetration. According to different sources, this indicator varies wildly from 8% up to 27%. The latter number is taken from research, accomplished by InMind and Factum-Group in eight CEE countries, claiming penetration in Ukraine to be one of the lowest in the region, compared to Slovakia with 51%, Lithuania with 56%, and Hungary and Germany both at 70%. Most of the web trends are reaching Ukraine with a certain delay. A good example is online services popularity. In contrast to the world’s slowdown in blogging, with 95% of blogs being abandoned by their authors, the Ukrainian blogosphere is still anticipating a peak of growth. As of June 2009, Ukrainian internet users created 420,000 blogs and 20,000 communities. During the first half of 2009, the number of blogs increased by 70%, while in 2007, this quantity was three and a half times smaller, as reported by Yandex. Rapid growth is the third feature of the Ukrainian web. As shown by the above mentioned study of Yandex, during the first six months of 2009, the Ukrainian Twitter community expanded in size by nine times. The same speed is observed in Facebook’s network popularity. While in late April 2009 Facebook had only 60,000 Ukrainian users, this number had doubled as of June 09. However, in building an effective online strategy, one should remember a fourth feature of Ukraine web 2.0. Despite growing popularity of global social media platforms, such as Facebook and YouTube, Ukrainian visitors prefer to use local versions of social networks. Similar to Russia, the most popular social networks are vkontakte.ru, a Russian language Facebook prototype and odnoklassniki.com, a local version of Classmates.com. These networks belong to the top six sites in Ukraine, according to Alexa.com. 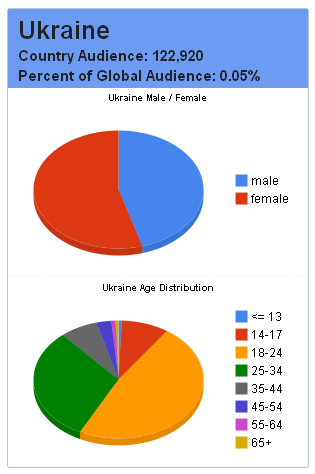 The fifth feature of the Ukrainian online community, is the demographic of the internet audience. 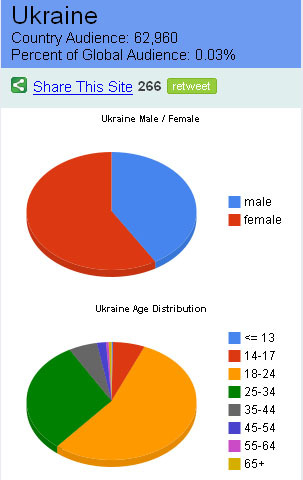 The typical Ukrainian blogger is a 22-year-old female, reports Yandex. And almost half of all Ukrainian users in Facebook are between the ages of 18-24 years old, while another 32% is no older than 34.